Djamila Grossman | The Salt Lake Tribune Jimmer Fredette drives against Arizona's Kyle Fogg on Dec. 11. Jaren Wilkey | Brigham Young University Jimmer Fredette responds to a standing ovation at his hometown game in Glens Falls, N.Y., on Dec. 8, 2010. 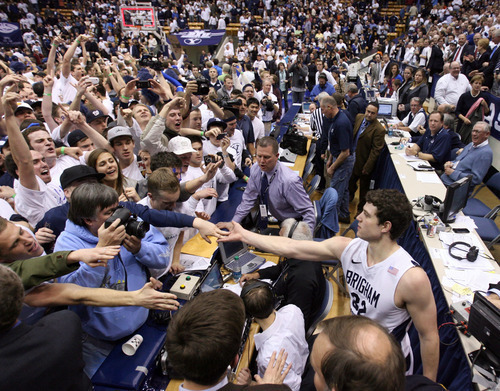 Steve Griffin | The Salt Lake Tribune After fans stormed the court following BYU's victory over San Diego State on Jan. 26, Jimmer Fredette greets his admirers. George Frey | The Associated Press BYU's Jimmer Fredette yells toward the crowd after making a 3-pointer against San Diego State in Provo on Jan. 26. Djamila Grossman | The Salt Lake Tribune Jimmer Fredette hits a 3-pointer, pushing aside UTEP's Gabriel McCulley, in a Dec. 23, 2010 game in Provo. 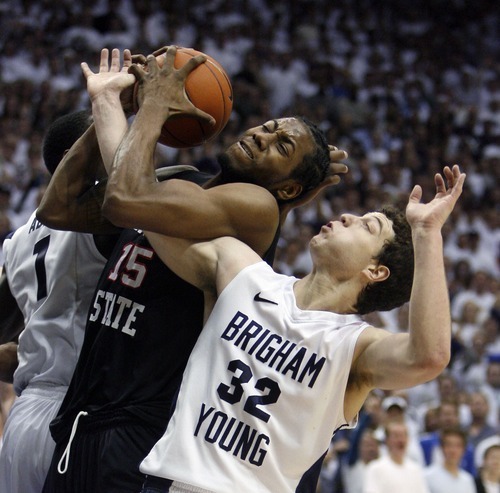 Steve Griffin | The Salt Lake Tribune Jimmer Fredette battles San Diego State's Kawhi Leonard for the ball during the second half of BYU's game against MWC nemesis San Diego State in the first of two meetings this season on Jan. 26. Leah Hogsten | The Salt Lake Tribune Jimmer Fredette drives past UNLV defenders at the Marriott Center on Feb. 5. Leah Hogsten | The Salt Lake Tribune Jimmer Fredette thanks fans for their support after defeating UNLV in Provo on Feb. 5. 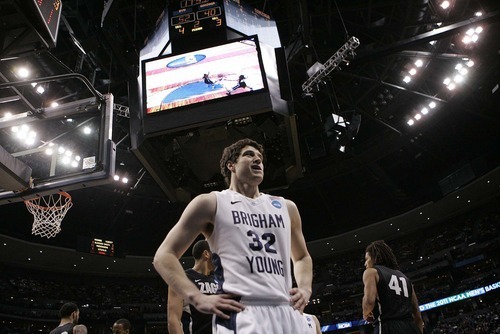 Trent Nelson | The Salt Lake Tribune BYU's Jimmer Fredette as BYU defeats Gonzaga in the NCAA Tournament, men's college basketball at the Pepsi Center in Denver, Colorado, Saturday, March 19, 2011, earning a trip to the Sweet 16. 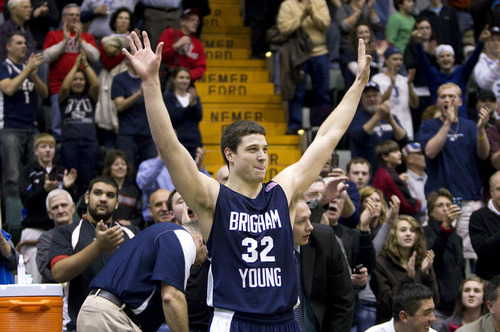 BYU's Jimmer Fredette is now 5 for 5 as far as national player of the year awards go in men's college basketball. Sunday night, Fredette was selected as the winner of the Naismith Award by the Atlanta Tipoff Club, and the winner of the Chip Hilton Player of the Year Award by the National Association of Basketball Coaches (NABC). The 6-foot-2 senior guard from Glens Falls, N.Y., received both awards in Houston, where he is attending events and ceremonies in conjunction with the Final Four games. 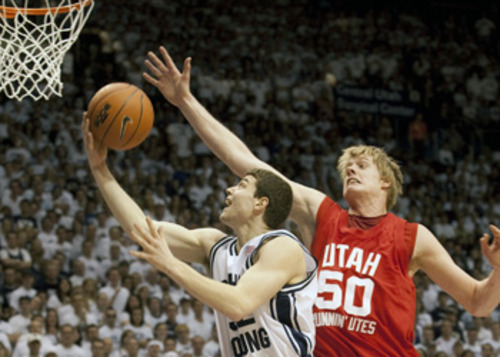 Fredette is BYU's first-ever winner of the Naismith Award. He's the second winner of the NABC honor, joining Danny Ainge, who won in 1981. 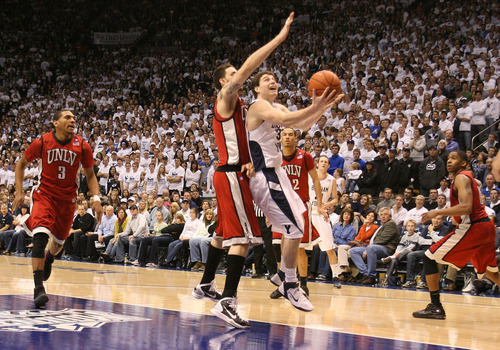 Fredette has now won the Oscar Robertson Trophy, the Associated Press Player of the Year award, the Adolph Rupp Award, Naismith Award and the NABC honor. All five are given annually to the top player in college basketball. Perhaps the most prestigious player of the year honor, the John R. Wooden Award, will be announced Friday at the Los Angeles Athletic Club in California. 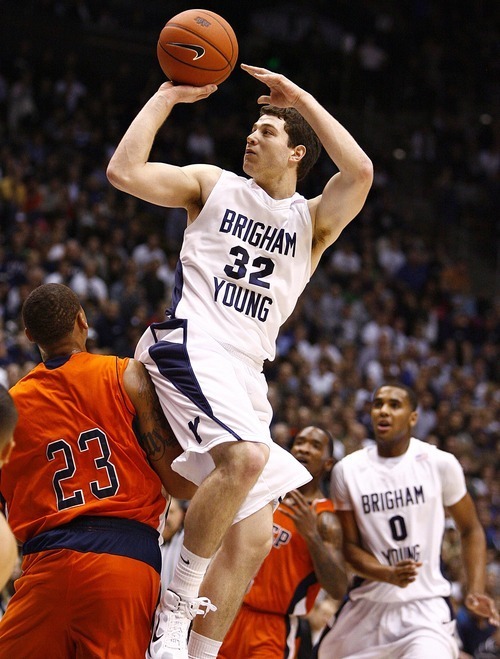 If Fredette wins that award, he will be considered the consensus player of the year. 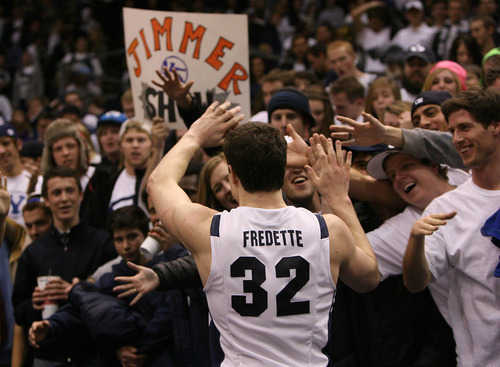 Fredette led the nation in scoring with a 28.5 average and helped the Cougars go 32-5, the best season by winning percentage and total wins in school history. On Thursday night, Fredette received the Rupp Award from the Commonwealth Athletic Club of Kentucky. He was named the AP Player of the Year on Friday.